성주 법수사지 삼층석탑은 신라 애장왕(800～809년) 때 창건한 법수사지(法水寺址) 내에 위치하고 있으며, 사지는 가야산 계곡을 석축으로 단을 조성하여 자리 잡고 있다. 사역은 남북 150m, 동서 150m 정도이고 크게 세 단으로 나뉘어져 있다. 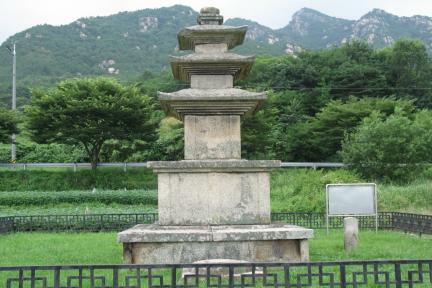 금당지로 추정되는 축대 아래에는 백운동마을이 자리잡고 있으며, 마을 앞에는 당간지주가 고목의 뿌리에 일부 쌓여 있다. 석탑의 높이는 5.8m이며, 상․하 2층 기단에 3층의 탑신부를 올린 양식으로 노반 이상의 상륜부는 남아 있지 않으나 보존 상태는 대체로 양호하다. 석탑은 규모가 작아지고 하층기단이 높고, 안상이 음각된 점 등의 9세기 후반기 특징을 보이고 있으나 옥개석의 층급받침이 5단인 점 등은 전형적인 신라 석탑의 모습을 보이고 있어 사찰의 창건시기인 9세기에 조성된 것으로 추정된다. 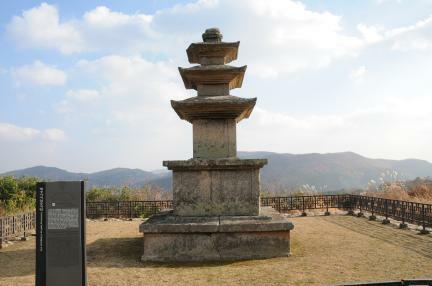 This Three-story Stone Pagoda of Beopsusa Temple Site is situated in the former precincts of Beopsusa Temple, a Silla temple located in Seongju, constructed during the reign of King Aejang (r. 800-809). 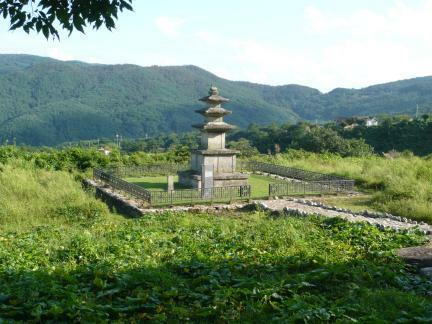 The temple, on a sloped lot in a valley of Gayasan Mountain, was built on a tiered stone embankment. 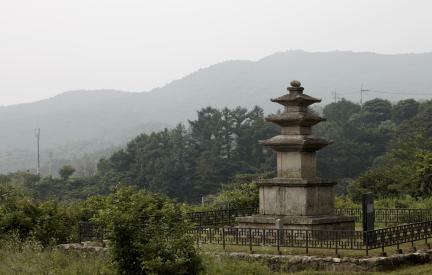 The temple lot extends abut 150m north to south and 150cm east to west and is divided into three tiers. 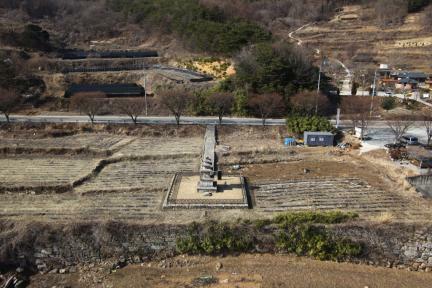 In the area below the stone embankment, presumed to have been the location of the main Buddhist hall, there is currently a village, and outside the village, the remains of flagpole supports, tangled with the root of an old tree. 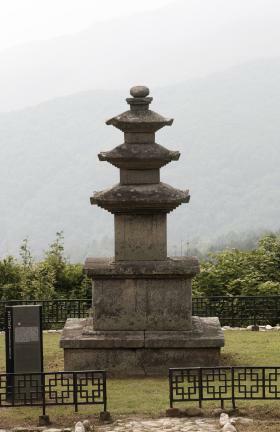 The stone pagoda is 5.8m in height, and the main body consisting of three levels is mounted on a two-tiered base. Although the pagoda no longer has its finial, its state of preservation is decent overall. 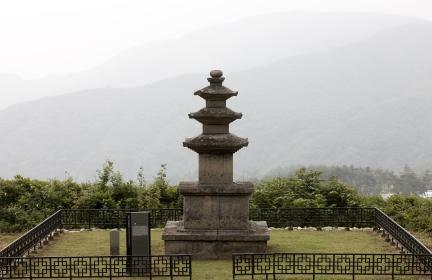 This pagoda displays the typical characteristics of late 9th-century stone pagodas which were smaller in size than in preceding eras with a high-rising base section and had eye-shaped motifs in incised carving. 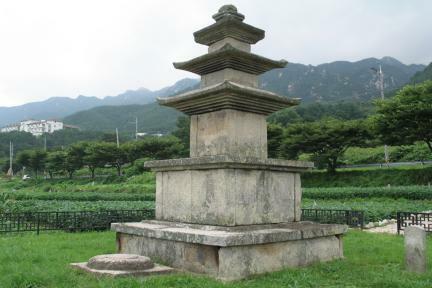 On the other hand, the five-tiered support under the roof stone is a signature detail of a Silla pagoda. 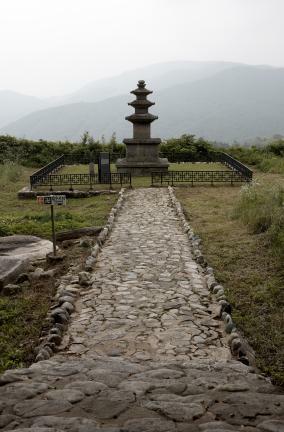 This pagoda is, therefore, likely to have been constructed sometime in the 9th century, at the time of the construction of Beopsusa Temple.